Rights: Original version in Portuguese by Victor Matioli. The 93rd issue of the institutional journal "Estudos Avançados" inaugurates a series of publications focused on primary and secondary education. The main dossier of this issue brings a set of articles on the teaching of humanities, area of knowledge chosen to open the sequence. Besides reflections on the current conjuncture of Brazilian education, the texts present reflections on the teaching of philosophy, history, geography, music, literature and religion. The journal also has three other sections, with different themes. In the first one, Urban Life and Health, four articles seek to understand how environmental and behavioral attributes of large cities affect the lives of their inhabitants. The second set of texts, Arts and Culture, brings comprehensive discussions on higher education in the arts and reflections on important works of the last century. The last section honors economist Paul Singer, who died in April, with a large and expressive interview in 2016. To editor Alfredo Bosi, the humanities face a paradoxical situation. "At the same time we have a reflection on the new methods proposed by pedagogy and specific didactics that open new directions for teaching, we face a depreciation of the same humanities by the technicist thinking that has been generalized in bureaucratic organs inside and outside the University," he points out. He believes that the intense demand for specialization generated by industrial and technological revolutions has hampered the balance between human and biological sciences. This context, according to Bosi, fuels the need to think about knowledge in a holistic and problematic way. A starting point, for him, would be to apply philosophy as a methodology of any and all modality of knowledge. "The reader will find articles by professors who experience this project both in public schools and in particular situations, such as teaching reading to inmates or the successful attempt to introduce Greek and Latin to elementary school students," he says. Bosi dedicates issue #93 to Paul Singer and Paulo Freire, who, according to him, "took their democratic ideals to the heart of the economy and pedagogy of the oppressed ones." Between 2012 and 2013, Ana Vieira Pereira participated in a series of workshops on creative writing and reading mediation at the Romão Gomes Military Prison in São Paulo. Pereira's experiences and apprenticeships in the period are reported in the article Sidelines - Literature Experiences with Imprisoned Persons, which also composes the main dossier. According to her, the work made it possible to perceive literature and the telling of their own history as "powerful mechanisms for the personal reorganization and the discovery of new forms within the field of language". In the article The reform of secondary education and its questionable conception of quality of education, Celso João Ferretti critically analyzes the reform promoted by the Ministry of Education in 2017. The political and economic interests of the restructuring, the ideological disputes that were presented and the official objectives announced by Michel Temer's government are some of the points dealt with by Ferretti. He further states that he has given "special attention to the curriculum flexibilization and the quality of education conception on which the reform is based." In the article Latin and Greek in a municipal school of Elementary School, Paula da Cunha Corrêa presents a successful pedagogical experience conducted from 2013 at the Desembargador Amorim Lima Municipal School of Elementary Education (EMEF.) Using the "Minimus" method, created by Barbara Bell, Corrêa has organized the implementation of classic language courses - Latin and Greek - for students in the 4th and 7th grades of the school, which is located in the city of São Paulo. According to her, in addition to language teaching, the project offers "diverse aspects of classical culture," to students, namely mythology, history, politics, theater, poetry, music, art and architecture." The "Minimus Project" is still in force and seeks new schools to expand its operation area. The first two texts of the section Urban Life and Health show the consequences of violence and lack of basic sanitation for the health of the peripheral population. 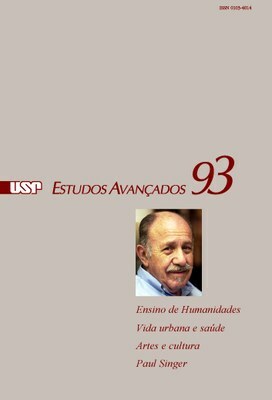 The latter two present comments on the last book authored by physician Paulo Saldiva, current director at the IEA-USP. In The metropolis and the health of its inhabitants, Helena Ribeiro describes and analyzes the general themes addressed in Saldiva's work. According to her, the book clearly shows "the problems that urbanization has brought to physical and mental health" of the inhabitants of large cities. Article writer Fabio Angeoletto emphasizes that the problems presented by Saldiva are not limited to São Paulo and other metropolises, but to all Brazilian cities, in Urban life and health. For him, the conclusion of the reading gives rise to a clear but not explicit message by the author: "Cities, in their complexity, demand planning, and multiple academic formations and social actors need to be involved in this work." Among the seven authors in the Arts and Culture section are former IEA Director Martin Grossmann and two USP professors that participated in the first edition of the Institute's Sabbatical Year Program in 2016: Dária Jaremtchuk and Lúcia Maciel Barbosa de Oliveira. The papers in this edition represent part of the results of their research at the Institute. In the article Abdias do Nascimento in the United States: a "black art painter," Jaremtchuk discusses the 10-year period that the Brazilian painter has spent in the United States. According to her, the time was fundamental for Nascimento to reaffirm "his commitment to the creation of works aligned with the African cultural heritage." In Oliveira's On Conquests and Tensions, in turn, there is a discussion on the emergence of new cultural dynamics anchored in information and communication technologies. "The current moment demands a non-simplifying understanding of the innumerable representations, contradictions, voices and silences that vie for visibility in the public arena," she argues. The last article of the issue celebrates economist Paul Singer, who died April 16, 2018, at the age of 86. Singer was a full professor at USP's School of Economics, Business and Accounting (FEA,) and a member of the first composition of IEA's Board (1987-1992.) Born in Vienna, he was the creator and greatest advocate of the "Solidarity Economy." The article Paul Singer: a life of struggle and work for socialism and democratic participation, by Cris Andrada and Egeu Esteves, presents an interview with the economist in the year 2016. Singer talks about his migration to Brazil, the youth in the Post-war São Paulo, his relationship with the union movement - with emphasis on the participation in the 300,000 Strike - and, notoriously, Solidarity Economy. "Only a few bring together intellectual greatness, genuine humility, and deep coherence between the writer and the practitioner," say the authors. "Paul Singer not only reflected on the violence of the world of work, but also devoted his studies to sharing it with workers, shoulder to shoulder, for years."